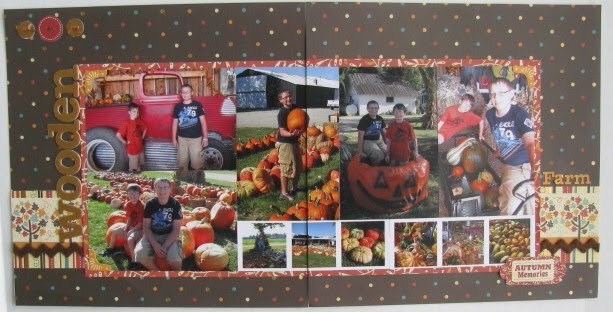 The new "Maple Grove" line from We R Memory Keepers was great for scrapping our photos from last month's trip to a local farm to get our fall display items. I got lucky and found the "slab" of the paper complete with a 12x12 die cut sheet, 12x12 sheet of mixed alpha stickers and 12x12 sheet of gold chipboard letters for only $8.99! The first layout I made for Blake's album is simply named "Wooden Farm" - the name of the farm. I had printed a 6-up 4x6 photo collage and just cut them in half to make the row of smaller photos. It was easy to "smoosh" my photos together and place them on one oversized photo mat. Then I was able to build the page around it. The next layout - "Sweet Family Fun" - is also for Blake's album. I was inspired by an October PageMaps sketch, but switched things up a bit and stretched it into a 2-page layout. Everything on this layout (and the one above) came from the slab with the exception of the felt rick rack that I added. I also used pop dots to add some dimension to certain elements. My final layout is for my personal album, so I scrapped it 8-1/2x11". 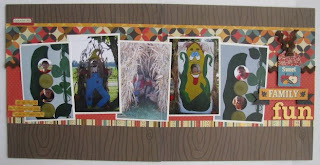 I was inspired by an Allison Davis layout that she posted during her October Sketch Week. It's an almost exact lift. I just loved the hand-stitching and use of leaves. I did have to hand cut those leaves out of the patterned paper. I think it was worth it though. I still have plenty of this line left to work with. That's a good thing, too, because I have PLENTY of fall photos left to scrap! I love the Allison Davis sketch layout...with the gorgeous stitching...I still want to make a layout just like that. Great looking layouts! My fav was 'I love fall', very nice! 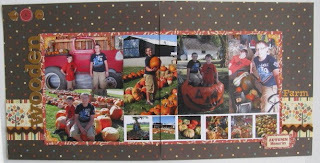 oh my goodness i love the "I love fall" layout but they are all great! You are amazing! 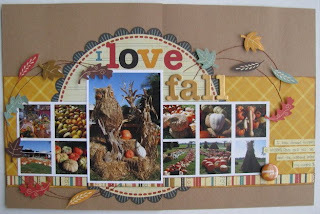 I LOVE your I LOVE FALL layout. It is so pretty :) You are making good use out of that slab.